Have you heard the dragons call? Have dragons appeared in your life lately through dreams, visions, meditations or signs? More and more Light Workers are starting to (re-)connect to Dragon Consciousness and awakening their own potential as co-creators. 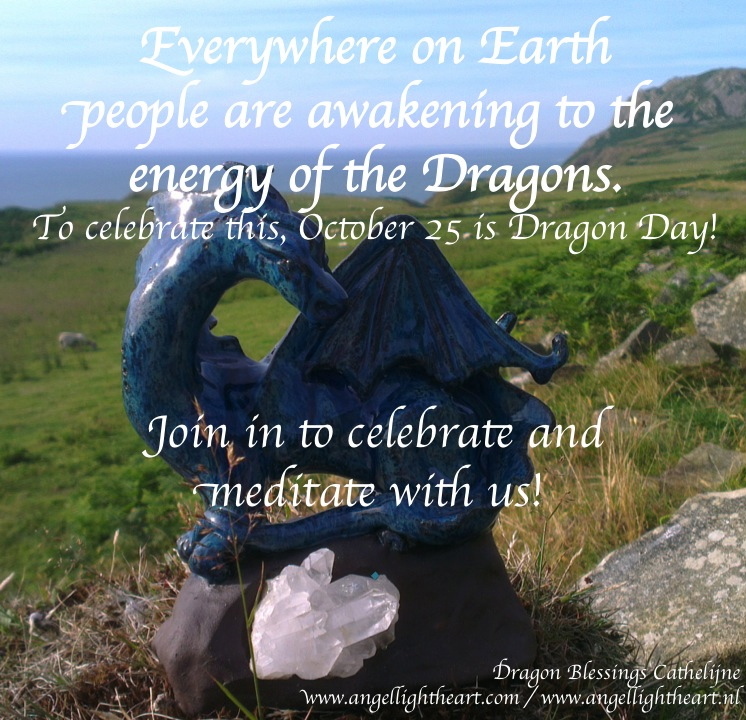 On the 25th of October 2014 people all over the world will be celebrating the Dragons and the Dragon consciousness. Please join in! My adventure with the dragons started about about five years ago after I bought a ceramics kiln and made a red and green dragon for a dear friend in Wales. Soon thereafter I was visited by a Golden Dragon in one of my visualizations. He has been a great help, both in my personal life and during healings and Light work. I was rather surprised by its immense energy. I had worked with angels and with unicorns in my meditations, sometimes with faeries, but dragons were unknown to me in the spiritual sense and I had not looked for them in any way. The dragon inspired me to create the Dragon Oracle and I have create many dragon sculptures since. My experience with the dragon energy is one of no nonsense support, yet at the same time deeply wise and magi cal. They like to help those who help themselves! And they like to empower those who use their power wisely. “We are the Dragons, higher dimensional beings that once lived and breathed on the great Mother Earth. Though Mother Earth was never the primary home of our souls we have resided on her and worked with her in close union. We protected her treasures and ignited the power of the ley lines. We yielded the power and magic of the elements. We worked to keep the Earth and its inhabitants safe and powerful. Our power was sought to be misused. It was misunderstood and feared. And so we have left this great planet in our physical forms many centuries ago. Yet many of us remain connected to Earth from our higher realms and when needed we are there to assist the planet and awakening beings on it in their journey towards healing and empowerment. For those of you who are on a path towards greater love, peace and enlightenment we like to tell you we are here when you need our help or protection. I felt goodness radiate from them as they worked with me. Dragons are often seen as a dark force. Who has not heard of the stories of bad dragons that needed to be slain? But as with all things of power, it depends on the intention of those working with it whether a force is for good or evil. Dragons come to us when we are in a higher state of consciousness. To reach this state of mind, meditation is always a good first step. To further open your consciousness to them, it can be helpful to focus on an image of a dragon, much like I did when I made the dragon sculpture. 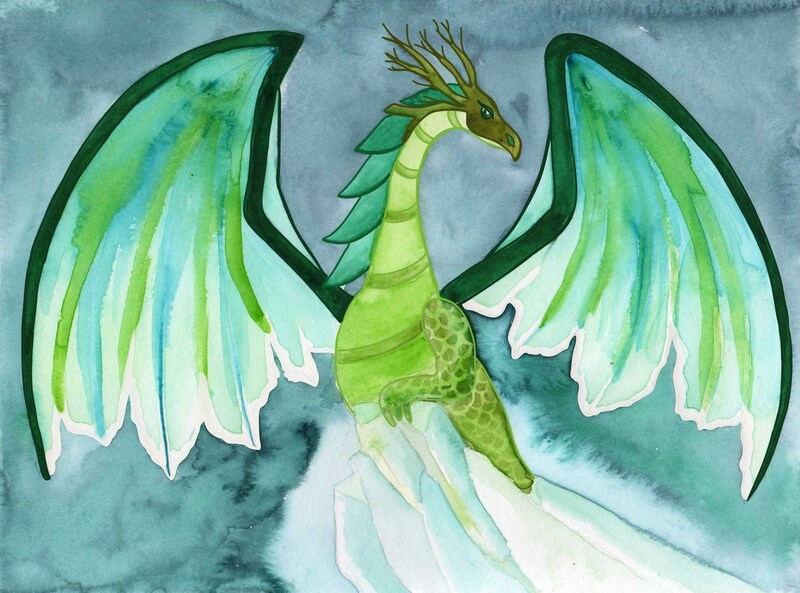 You may want to purchase a dragon card, painting or sculpture to look at from time to time. Or equally, you can make on yourself! “The teacher comes when the student is ready.” So even though dragons do not care for being summoned, you can pave the way for their arrival by stating those things within yourself and your life you wish to transform and tell the dragons you would very much welcome their help. As said they like to help those who help themselves, so make sure you start making changes in the area you need help with. No matter how small the changes, it will send out a signal of your desire for change and growth. Use the Dragon Oracle to work on your personal and spiritual growth. Use Dragon Essences to attune to their energy. Visit a ley line and send white light through it to raise the vibration of the area it flows through. The ley lines are sometimes called dragon lines and you can imagine a crystalline dragon helping you with your Light Work on the ley lines. Ground yourself properly and call in spiritual protection before you start your meditation. Prepare yourself for this meditation by relaxing your body and breathing deeply. Imagine walking in an ancient forest. The trees are thick and gnarled and your feet are touching a thick blanket of moss. Spiders weave their webs and birds sing their songs. As you move deeper into the forest you find a cave before you. As you enter this cave a red light radiates from the crystals in the cave. In the middle a red dragon raises itself up and it breathes the red light over you and through you, bringing you strength. You thank the great being as you leave. As you walk onwards within the cave, you find an opening to an alcove, shimmering in orange. There an orange dragon awaits you amidst orange calcite stones. The dragon looks you in the eyes and from its eyes a beam of orange light emerges. The light surrounds you and encourages you to live your dreams and follow your passions. Again you thank the dragon as leave the alcove and move deeper into the large cave. Another area of the cave appears; this one a shining yellow citrine area. A yellow dragon moves its talons through your aura and you see it cutting away dark cords from your being. It then softly touches your solar plexus, empowering you with golden yellow energy. You thank the dragon as you move onwards. A lovely green dragon appears. It is surrounded by the most brilliant emerald cave as it shines soft green light from its huge heart into yours, bringing forgiveness and healing of the heart. You feel your chest expanding and your heart filling itself with love. You send back love to the dragon before you leave its lair. Onwards a blue dragon lies in another alcove of deep blue sapphire. From its throat radiates a clear blue light into your throat chakra as it gives you the power to express your feelings and speak your truth. You thank the blue dragon as you continue on your journey. You keep walking through the caves as an indigo dragon appears in a dark blue cave that looks like the night sky. It touches its brow to yours, sending indigo energy into your third eye to awaken your spiritual sight. You bow deeply to this great Master. Finally you enter a beautiful amethyst cave. A great purple dragon with butterfly wings motions you to come closer. It lights a campfire for you by spitting violet fire onto the ground. It encourages you to give all that no longer serves you to the flames. You gladly do so, thanking the dragon for its wonderful help. As you walk on you hear a great rumbling sound and you realize you have come to the end of the cave It is covered by a great waterfall, which radiates rainbow colours. You step through it as it cleanses your aura and brings together all the attributes of the colourful dragons. As you emerge from the waterfall a white, crystalline dragon soars in the sky. It looks magnificent and reminds you of a unicorn with its white, spiral horn. It lands before you and touches your forehead. You feel a strange tingling sensation and as you look into the lake at the bottom of the waterfall you see a diamond shaped light on your forehead. It will help you use your spiritual power wisely. Now you are ready to return to the place where you started, to your own body. Make sure you ground yourself as you return to your normal consciousness and write down any insights you received during this meditation. You can also visit my Youtube Channel and listen to the Dragon Meditation there. PS if you want to work with the energy of the dragons, you can now order the Dragon Oracle through http://www.angellightheart.com or via my etsy. Email me at angellightheart@hotmail.com to receive more information or order. Equally I love making personalized Dragon Sculptures. 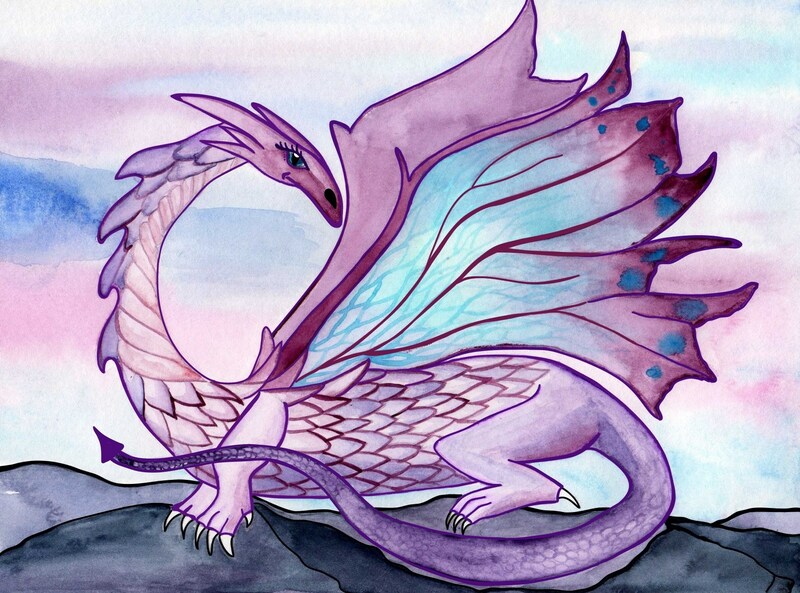 This entry was posted in Dragons, Light work and tagged 2014, dragon oracle, dragons, meditation, October 25, World Dragon Day on October 12, 2014 by Angel Light Heart.